If you’re an entrepreneur, contractor or owner of a small business, you need General Liability Insurance - no ifs, ands or buts about it. When it comes to business insurance, this is the baseline and first type of policy you should purchase. It gives business owners peace of mind in knowing that in the case of an accident - such as someone slipping and falling on their property - their business is protected. Read on to find out all about it in our comprehensive guide to General Liability Insurance. On a day to day basis, it’s likely that you and your employees are interacting with many people - such as clients, vendors and contractors, to name a few. Any one of them could experience an injury or loss. If your business is the cause they can file a lawsuit against it. General Liability Insurance is a business insurance policy that is applicable to most contractors and business owners because it protects them. When a business has this type of insurance policy, they're covered when it comes to claims of bodily injury, associated medical costs and damage to property that occurred as a result of your business operations. It also covers legal defense costs, along with settlements and judgments should you be successfully sued. If you are a tenant who causes damage to a property that you rent (like, for example, a fire), that’s another situation where under a General Liability Insurance policy, you’d be covered. Lastly, these types of policies cover claims of false or misleading advertising. That could include libel, slander or copyright infringement. This type of insurance is often referred to as “Business Liability Insurance” or “Commercial Liability Insurance.” Call it whatever you’d like, but just make sure you have this policy in place - because not doing so could prove very costly. General Liability Insurance protects your business from 3rd party bodily injury, property damage and personal/advertising injury claims. It is important to note that if you have a customer's property in your possession for servicing, cleaning, repairing or storing (Example: dry cleaner, appliance repair store), coverage for damage to the customer's property will be excluded and will need to be purchased under a commercial property or inland marine policy. It’s also important to know that this insurance covers the people associated with your business, as well as other businesses. For example, if you have a partnership or joint venture, all of your partners and members would be protected, along with their spouses, if they are sued for something they do as part of their job. If you own a corporation, this insurance policy will cover all of your executive officers, directors and stockholders while they are acting in an official capacity. It also protects your employees from lawsuits resulting from actions they took on the job. Those associated with your business don’t necessarily have to be employees, partners or customers to benefit from coverage. These insurance policies also include volunteers for liabilities that result from the work they do for you. If you work with vendors, like contract salespeople, you may have a written agreement to indemnify a person or organization. Under this type of policy, these people and organizations would be protected against liability claims (like property damage or bodily injury) that happen as a result of selling or distributing your products. Here are some examples of situations in which you’d be thankful you had a policy. Bodily Injury If someone is injured at your business or because of your business - including employees and customers - you are legally liable for their injury, including medical payments. A customer or employee slips in your store, and hurts themselves. They require medical care, and bring a suit against you for the damages. Property Damage In the course of doing business, you cause damage to someone else’s property, whether that’s an actual property location (like their building) or simply an item they own. While working as a contractor at your client’s place of business, you accidentally break something and cause costly damage to their facility. Data Loss Today, data is considered a valuable asset by many companies. If they suffer a data loss due to your business, you could be held liable as it could fall under the umbrella of property damage. Your marketing technology company stores valuable data about a retail store’s customer preferences on its servers. Unfortunately, one of your employees accidentally deleted important files that can’t be recovered. The retailer brings suit against you, claiming the loss of data has caused significant financial harm to their business. Personal Injury This can include false advertising, copyright infringement, libel or slander. One of your employees shares unflattering information about a customer with someone else who works in the same industry. Word gets back to your client that they are being bad-mouthed, and they sue for slander. Property Damage Due to Disasters Sometimes things happen to your property that are beyond your control, like a natural disaster, fire, lightning strike or theft. Your neighborhood experiences a major storm, and your business is flooded. With insurance, you’re covered for the costs of repairs. Rental Property Damage If your business rents property from a third party, you could be held liable for damages. An employee spills something on the floor at the venue you rented out for the company holiday party. Financial Loss If you sell products or services to clients, there is a risk that they could hold you liable for financial losses caused by said products and sue. You sell a customer a software product that is supposed to streamline their invoicing process. However, it ends up complicating things and frustrates their clients, resulting in the loss of an important account. Failure to Deliver on Promises If something happens that causes you to be unable to deliver the product or service you promised to a customer, you could be liable for any loss that results. You run a business that delivers products to other businesses. A supplier you use shuts down suddenly and is unable to ship products you delivery frequently, causing a significant loss in sales for your clients. Liquor Liability If your business does not manufacture, distribute, sell, serve or furnish alcoholic beverages, your General Liability insurance policy will cover you if are held liable for a liquor-related accident. If you are a business that sells liquor (like a restaurant), you’ll need to purchase a separate Liquor Liability insurance policy. This type of coverage is important if you distribute alcoholic beverages occasionally, such as at your office holiday party or a team happy hour. If an accident occurred, you’d be covered as long as you didn’t charge money for the alcohol. Property damage, including to property you are a tenant at and someone else’s property you use in the course of doing business. Judgements and settlements, including medical expenses. While this insurance offers broad protection for your business, it doesn’t cover absolutely everything. For example, this insurance will not protect you from claims of negligence, even if it isn’t your fault. This is one reason why many contractors and business owners choose to buy additional business liability insurance policies. If you or your business own commercial properties, such as a garage or a storage facility, you would likely benefit from the additional protections provided in a Business Owner’s Policy. Likewise if you or your business provide professional and personal services, you’ll almost always want to purchase Errors and Omissions insurance in addition to this insurance. In general, damage that is caused intentionally or results from crimes committed by the insured will not be covered under a General Liability Insurance Policy. This protects the insurance company from fraudsters, like a business owner who sets fire to their own policy in order to collect money, as well as organized crime. If this provision didn’t exist, criminals would be able to purchase insurance to cover defense costs in the case of legal action brought by their victims. What Are the Limits of General Liability Insurance? Like most insurance plans, this type of policy will clearly outline its limit, or the maximum amount the insurance company will pay against a liability claim. It’s important to assess your risk carefully to ensure you have adequate coverage and won’t be left paying for expenses out of pocket. For example, if your small business is sued for $300,000 in medical costs associated with a slip-and-fall injury, but your policy limit is $250,000, you will have to cover the difference of $50,000 yourself. It is important to research your industry research before investing in a policy. The cost varies. The coverage your business needs depends on the type of business you operate, as well as the perceived risk associated with you or your industry. For example, a marketing consultant would need less coverage than a building contractor. Your location is also important, as some states tend to award more in damages to plaintiffs claiming personal injury than others. If you live in one of those states, you’re likely to face higher premiums. Minimum premiums start from as little as around $350 per year. However, most annual premiums for small businesses range from $750 to $2,000 depending on your type of work and coverage needs. That’s certainly a lot less than the thousands, if not millions, of dollars you may need to spend fighting your case in court. If you fall into a low risk category, you may want to consider a Business Owners Policy, which would combine both General Liability Insurance and Property Insurance at a more affordable rate. If you already have a Business Owner’s Policy, you should double check it to see what your coverage limit is. If it’s low, you’ll want to consider purchasing a second separate policy that will provide additional coverages. In today’s society, lawsuits are increasingly frequent. No matter how small your business is or how unlikely you think it is that you’ll ever face a claim, you’re still exposed to liability risks at work. An insurance policy costs very little when compared to the expenses your business will incur. Below you will find the most popular questions we received from our users. If you don't find your question covered below, feel free to call us and our consultants will support you. Q: how much is general liability insurance for a small business? A: General liability insurance premiums vary depending on the specifics of your business but can be as low as around $350 per year. The average costs range from $750 to $2,000 annually. Even the top end prices are significantly less than the severe costs you'll face if someone files a lawsuit against you. Exact costs will depend on factors such as your business type (with some industries more prone to risks than others), business size, perceived risk including your claims history, and which state you are located in. Your insurance carrier will gather the necessary information from you before calculating your premium. Q: what does general liability insurance cover? A: General liability insurance covers you against 'third-party lawsuits' brought against you by anyone who is not an employee. Coverage includes injuries and accidents occurring on your premises, property damage (including damage to equipment or cyber property) and non-physical personal injury such as reputation damage. It will also cover legal and medical costs associated with the claim. Coverage extends to others associated with your business (such as employees, partners or volunteers) while working or representing your business, regardless of location. However, it does not cover intentional damage or claims arising from negligence. Q: what is commercial general liability insurance? A: Commercial General Liability (also known as just 'General Liability Insurance', 'Commercial Liability Insurance' or 'Business Liability Insurance') is an essential form of insurance if you are a small business owner, entrepreneur or contractor. It is a broad type of liability insurance for businesses to protect them against common risks that can occur. This insurance will cover you against things such as bodily injuries and property damage to 'third parties' (anyone who is not an employee e.g. a business partner or a customer). Q: how to get general liability insurance? A: It's easy to get general liability cover for your business by providing a few simple details about your business, such as location, nature of business and contact details. You can go visit an insurance company or directly get a quote within minutes with a few clicks of a mouse. A consultant will normally then get in touch with you to discuss the details of your quote. Q: what is general liability insurance for contractors? A: General Liability Insurance for independent contractors is very much the same as for standard businesses. If you are an independent contractor, it is likely you will be working with customers or clients and this carries the same risks concerning bodily injury and property damage regardless of the field you are working in (from IT to construction). This insurance will also cover you against delays in completing work due to issues such as inclement weather. General Liability Insurance is an important consideration for contractors and many businesses now ask for a Certificate of Insurance before they subcontract work out. Q: what is comprehensive general liability insurance? A: Comprehensive General Liability Insurance is another term used for General Liability Insurance, albeit one that's not used quite as frequently nowadays. 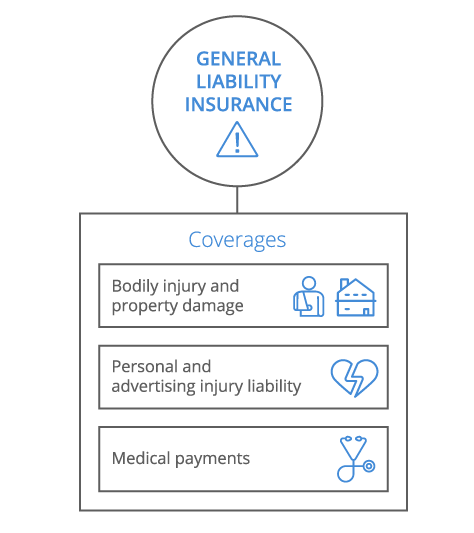 If you see the term Comprehensive General Liability Insurance, don't be fooled into thinking this is something distinct from normal General Liability Insurance. It's also important to remember that no insurance policy is fully 'comprehensive' as all policies have limits and exclusions to what they will cover. Your insurance carrier will explain to you what these limits and exclusions are. Q: is general liability insurance required by law? A: Liability insurance of some kind is mandatory for most types of business. General Liability Insurance is the most common form opted for by most businesses as it covers against the key risks. You will need this insurance if you have clients or customers at your workspace, if you use third-party locations for business purposes or if you handle a client's equipment. If you are working on a contract, a Certificate of Insurance may be required. Some businesses choose to combine General Liability Insurance with Commercial Property Insurance in a Business Owners Policy. Q: what does general liability insurance cover for contractors? A: General Liability Insurance coverage is similar for contractors to what it is for standard businesses. It will cover you against bodily injury (accidents to others) and property damage that occur at your workplace or are brought about by your work activities. It will also cover against personal and advertising injury claims, financial loss suffered by a client due to work carried out, and any claims against you if you are unable to complete work by an agreed completion date (e.g. due to weather circumstances). Q: how much general liability insurance do I need? A: Your coverage needs will depend on a number of factors. Firstly, your type of business. Some industries are more prone to risks, so for example a building contractor will need more coverage than a web designer. Secondly, the size of your business. A busy restaurant in the city centre will need more coverage than a small rural cafe. Thirdly, your location is a factor as some states tend to award more in damages than others. Most small businesses opt for coverage limits of $1-2 million. If your business is in a low risk category, it might be worth considering the Business Owners Policy. Q: how much is a million dollar general liability insurance? A: Your exact insurance premiums will depend on those factors of size and type of your business, location of your business as well as your insurance history. But the typical cost of insuring your business with a limit of one million dollars pay-out is around $1,000 to $3,000 annually. You can choose to lower this limit, which you may want to do if your business is very small or low-risk. Or you may wish to increase this limit or purchase excess or umbrella insurance if you feel that a $1 million is not sufficient to cover your risks. This insurance is incredibly important to the health and happiness of your employees. If your company hires vehicles or allows employees to borrow company vehicles for business purposes, you will need this insurance. It will cover claims of personal injury and property damage should something go wrong on the job. Business Interruption Insurance covers you for lost income if your company has to vacate its location due to damage caused by a disaster, such as a fire. This policy also covers operating expenses, such as electricity, that continue to bill even though your business activities are on pause. This insurance protects a broad range of equipment against breakdowns caused by motor burnout, power surges, boiler malfunction, and operator error. Equipment Breakdown covers the cost to replace or repair the damaged equipment, as well as other expenses incurred due to the damaged equipment.